For a long time, the FAA regulations reached only pilots and aircrafts that carry people. Recently, however, they have several new types of aircraft to test the FAA’s authority. One area of developing law is private space flights. It Is only been the last 5 to 10 years the private space flight to become viable, and thus testing the FAA's regulation. This week the FAA issued an opinion that the regulatory body and its laws apply to unmanned personal drones, like those frequently used for capturing video or photos. The case in wish this was determined was about the photographer who is taking photos of eight university campus “a reckless manner.” The drone flew so close to somebody that they have to duck to avoid the drone. That individual then sued the photographer alleging that the done was flown contrary to applicable FAA regulations regarding the reckless operation of aircraft. The photographer claimed that the FAA regulations did not apply to drones. In response, the FAA's opinion stated that the regulations related to reckless operation do apply. It said that the definition of an “aircraft" it's actually quite broad. Specifically, an aircraft is “any device used for flight in the air. This includes any aircraft maned or unmanned, large or small.” While the FAA definition has a broader reach, the defense attorney claims of the ruling is “narrowly limited to whether unmanned aircraft systems are subject to a single aviation safety regulation concerning reckless operation.” Like most things, the truth probably lies somewhere in the middle. It seems that in just the past two years, the use of drones has increased many fold. 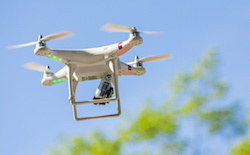 The increased activity seems to be fueled by the ease of operation of many of these drones as well as the shrinking price tag for these devices. Also, the GoPro style adventure cameras have become so mainstream that a drone is a common accessory. In any event, with more and more of these drones in the sky operated by ammeter pilots, it is likely that there will be accidents and injuries caused by the reckless operation of the drone's "pilot." This opinion should clarify some of the liability and make recovery for those injuries easier.